The Promise Ring meaning is about commitment - usually, but not always to a monogamous relationship. There are other reasons that a promise ring is worn, covered further down on this page. Promise rings can be worn on any finger, but those symbolizing pre-engagement are generally worn on the left ring finger; sometimes, the left middle finger or right ring finger is used instead to prevent confusion with an actual engagement ring. In the History of Wedding Rings the Promise Ring is worn as a token of commitment to one another given Before the Wedding Ring. A Promise ring meaning is an outward expression, or symbol, of a promise between two people. The Promise ring is traditionally given for any type of promise made between two people - either romantic or platonic and the bestower can be a man or a woman. It basically serves a similar purpose as the ancient FEDE Ring (Italian word for TRUST) did. The Fede Ring is decorated with a pair of hands clasping each other that form the bezel. Usually Fede rings were made of silver, sometimes gold. They have been used since ancient Roman times and were popular throughout Europe from the 12th until the 18th century. Before engagement: if you are serious but not quite ready for an engagement ring, then the Promise ring expresses a strong commitment to the relationship and a promise for the future together. A pearl is a very suitable gem to seal a promise of marriage as the pearl is the wedding symbol par excellence, denoting purity an has surprisingly, embodied sexual references throughout history. Click here to read about the sexuality of wedding rings. Natural Pearls, are very rare, and hard to find and consequently - expensiveso a promise may be set with cultured pearls or a solitaire Pearl. Symbol of Chastity: Promise rings are also called "purity rings" and can be given by a parent to a child and is symbolic of a promise by the child to the parent to remain a virgin until marriage. The Promise ring meaning acts as a constant reminder that true love can wait for a sexual relationship. 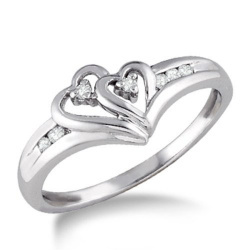 Purity rings can also be given to symbolize a child's promise to remain substance free. Symbol of Monogamy: Promise rings can be exchanged as a mutual sign of a partner's commitment to monogamy. Friendship: Throughout the ages, close friends have always made pledges, sealing them with the exchange of friendship promise rings and other small tokens. Symbol of Intimacy and Closeness: If your friend is living in another country or lives next door, the Promise rings signifies to you both that you will always be there for each other. When giving a Promise Ring it is important to be up-front about the terms of the promise. A handwritten note accompanying the ring, read prior to opening the gift, can clarify your sentiments. The "Keeper" ring is also known as a GUARD ring that was introduced in 1761 by King George III who presented a wedding ring band encircled with diamonds to his bride, Queen Charlotte. Today Keeper rings continue their popularity as unusual wedding rings, unique engagement rings, eternity rings and anniversary bands. Keeper rings, once the privilege of only the aristocracy (until the late 1800's) quickly filtered down to all of us - the common masses. Promise Rings and the Keeper Rings do however have one thing in common. Both of these types of rings fall into the category of unique rings and sentimental jewelry, loaded with intimacy and personal significance for the owner. I promise to use it only to send you Yvonne Hammouda-Eyre News.